Heilbronner came to Bonn to protest against the deployment of nuclear missiles in the neighborhood of their city. The Intermediate-Range Nuclear Forces (INF) Treaty between the United States and the Soviet Union ushered in the end of the cold war. The US withdrew its Pershing II missiles and the Soviet Union withdrew its SS-20s. Both countries were unwilling to use nuclear weapons, understanding the consequences of doing so—the Pershing II was a hundred times more powerful than the Hiroshima bomb. As a part of the treaty, both countries agreed that some of the missiles would be put in museums so that the public could see them and understand their history. A Pershing II and SS-20 are on display at the center of the National Air and Space Museum in Washington, DC. The treaty that banned these ballistic missiles was a step back from nuclear war and a harbinger of the Cold War’s end. The SS-20, known as the "Pioneer" in Russian, is a two-stage, solid propellant missile with three multiple targetable reentry warheads. The missile is almost 16.5 meters tall. The exterior of the first stage is yellow fiberglass with numbers and Cyrillic letters printed along the circumference. The letters and numbers are used as guides in the manufacturing process when the solid fuel is covered with fiberglass. Two thirds of the way up the missile are the letters "CCCP" and a yellow five-point star. The second stage has similar markings. The reentry vehicle consists of three warheads. The predominant color of the missile is green. Along the base of the missile are white fan stabilizers that assist in guidance. The Votkinsk Machine Building Plant, USSR, constructed the missile for the exhibition at the National Air and Space Museum. 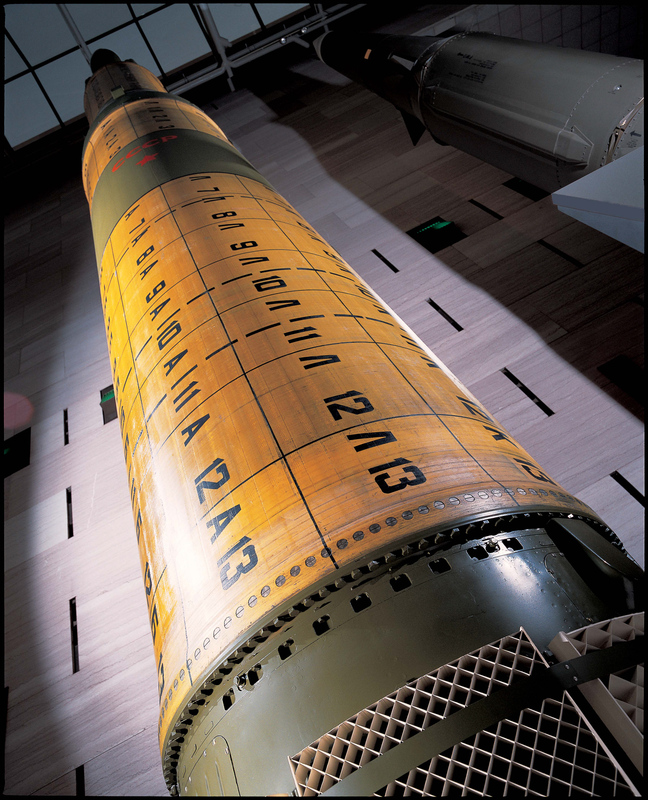 Exhibition of this missile complies with the Intermediate Nuclear Forces agreement between the US and USSR that provided for the preservation of fifteen SS-20 and Pershing II missiles to commemorate the first international agreement to ban an entire class of nuclear arms exhibition. It does not contain fuel or any live components. The Ministry of Defense of the USSR donated the missile to the Smithsonian. The deployment of intermediate-range ballistic missiles in the 1980s ignited protests throughout Europe. The elimination of these weapons greatly reduced international tensions. The numbers and letters on the sides of the SS-20 were a part of the manufacturing process, in which the fiberglass body of the missile was wrapped around the solid rocket fuel.